Loweswater is a tiny village situated in the picturesque and tranquil Lorton Vale within the Lake District National Park. It houses the Church of St. Bartholomew built in 1827 and restored in 1884, and a pub the Kirkstile Inn. The village also lies at the foot of Loweswater Lake which is one of the Lake Districts smaller lakes, and is about 8 miles below the town of Cockermouth. To the south the lake and village are overlooked by the Loweswater Fells consisting of Mellbreak, Gavel Fell, Blake Fell, Hen Comb and Burnbank Fell and to the north-west by Fellbarrow and Loweswater Fell (Low Fell). Lorton Vale is a wide valley running from Cockermouth in the north to Crummock Water and Buttermere in the south. The vale is a great place to escape the hustle and bustle of everyday life and unwind in its beautiful scenery with many activities such as sailing, canoeing, fishing and along with lakeside walks there are many footpaths to enjoy. Crummock Water, situated between the lakes of Loweswater and Buttermere, is owned by the National Trust. It is about 2½ miles long by ¾ of a mile wide and 140 feet deep, has six small islands and is dominated by the hill of Mellbreak which runs the full length of the lake on its western side. Scale Force the highest waterfall in the Lake District with a drop of 170 feet feeds Crummock Water and the River Cocker flows northwards from the lake into the Lorton Vale. 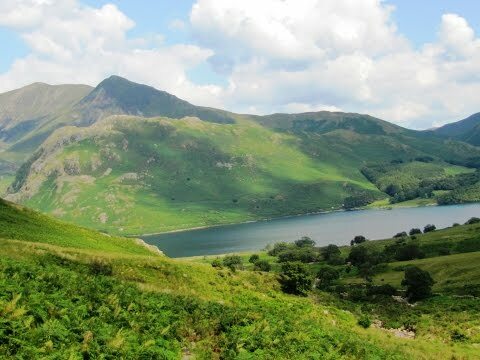 There is a lakeside footpath around Crummock Water and also around Buttermere which can be combined as one walk. Buttermere the lake from which Buttermere village takes its name is about 1¼ miles long by about ¼ of a mile wide and 75 feet deep. It lies at the head of the valley of the River Cocker and Buttermere village is situated between the two lakes. Mellbreak is surrounded on three sides by a moat of deep marshy land and to the east it slopes steeply down to the shore of Crummock Water. Although it stands on its own it is surrounded by the more dominant hills of the Loweswater Fells, the High Stile Ridge and the Grasmoor Group. Mellbreak has two summits of 509 metres to the north and 512 metres to the south and dips in the middle to 447 metres. Both summits have cairns the northern top being rocky and situated on top of the crags that make up the very steep almost vertical north face the southern top slopes steeply but more gently down to Scale Beck. Mellbreak’s isolation offers superb views from both summits. The north top looks out to the Solway Firth, Loweswater Fell and Fellbarrow, the south top across Crummock Water to Rannerdale Knotts and Grasmoor and beyond on a clear day a glimpse of the Helvellyn Range, southwards to Red Pike, High Stile, Hay Stacks and Fleetwith Pike. Mosedale is a very pretty but marshy valley below Mellbreak’s western side. Its beck flows north to Loweswater village and on the other side of the valley is the parallel ridge of Hen Comb. From the telephone box we walk down the little road signposted Kirkstile Inn. At the inn we turn left and immediate right signposted no-through road to cross over the bridge. We pass to the left of a farm and the lane soon becomes a stony track. When we come to a gate we go through and turn right following the wall on our right. We follow the track with Mosedale Beck down below on our right for about a mile to a cairn. We then bear left at the cairn slightly uphill following the path. We pass an iron isolated gate and keep heading forwards towards Red Pike in the distance. When the path splits we keep heading forwards downhill over the marshy land, there are a few faint paths, towards the beck at the bottom. When we reach the fence we go over the stile and head forwards downhill to a track with a gate on the right, we turn left here. We soon pick up the side of Scale Beck and follow the path with the beck on our right. We pass two footbridges and then bear left and head to the shore of Crummock Water. We now keep following the path at the side of the lake for just over a mile. We then take a path on the left going uphill to a wall corner. At the corner we head forwards following the path with the wall on our right. The path bears right between some buildings and we follow the track to the small road. We bear right over the bridge then left at the T-junction to the Kirkstile Inn and then turn right back to the telephone box and our car. This is an easy walk on good tracks and paths although there is one boggy patch at the end of Mosedale. Approx 6 miles allow 2½ to 3 hours using OS Explorer Map OL4, The English Lakes North Western area. Start Point: telephone box on the top road that bypasses Loweswater village. Loweswater village, Lorton Vale in the Lake District, Cumbria. From the A66 turn off at Braithwaite onto the B5292 and follow the road along the Whinlatter Pass. At the main t-junction turn left onto the B5289. Follow this road, passing through Low Lorton for just over 2½ miles and take the right turn for Loweswater. Continue for about 1½ mile to the parking area at the telephone box on the left. Parking: car parking areas next to the telephone box on the top road that bypasses Loweswater village and just over bridge past the kirkstile Inn in Loweswater. There is also a car park at Lanthwaite Wood and at nearby Maggie’s Bridge near Loweswater lake, allow extra mileage and time from these car parks. There are no public toilets the nearest ones are at Buttermere in the car park. For refreshments there is a pub the Kirkstile Inn in Loweswater village and at Buttermere there are two cafes selling local produce and two pubs The Bridge Hotel and The Fish Inn. The next nearest public toilets, shops, cafes, take-away, pubs and restaurants are in Keswick and Cockermouth.